It has long been known that marihuana consumption acutely increases appetite (Hollister, 1971) and decreases body temperature (Borgen et al., 1973). These effects predicted that cannabinoids may control energy homeostasis. Later, the endocannabinoid system was discovered, and its role in energy homeostasis moved into focus. The main psychoactive constituent of marihuana, Δ9-THC, as well as the endocannabinoids, anandamide and 2-arachidonoylglycerol, were shown to stimulate appetite centrally in animal models and in man (Sacks et al., 1990; Williams and Kirkham, 1999; Di Marzo and Matias, 2005). As the ultimate evidence, genetic ablation of the CB1 receptor was shown to lead to reduced food intake after food deprivation, leanness, resistance to diet-induced obesity, and enhanced leptin sensitivity (Di Marzo et al., 2001; Cota et al., 2003b; Ravinet-Trillou et al., 2004). Meanwhile, obesity and obesity-related complications have put an increasing burden on Western societies' health care; therefore, a large effort has been made to map the role and the therapeutic potential of the endocannabinoid system in obesity and cardiometabolic disorders. This research finally resulted in the introduction of the CB1 receptor antagonist SR141716A (also known as Rimonabant) in the European market under the name AcompliaTM in the summer of 2006, to treat obesity and its metabolic complications and cardiovascular risk factors (Gelfand and Cannon, 2006). AcompliaTM is the first CB1 receptor-based medicine. 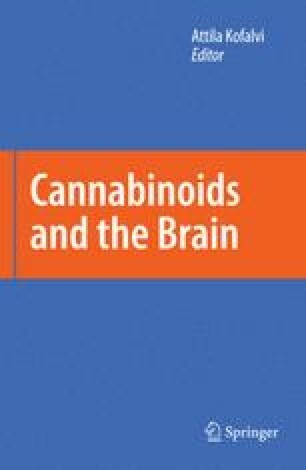 The discussion of the role and clinical impact of endocannabinoids on energy homeostasis, obesity, and diabetes also cannot be limited to the brain. Therefore, although this book is mostly about the CNS, a large part in this chapter will detail peripheral mechanisms as well.